Créations Dorées is a company born out of and driven by passion. It’s two founders, Stéphanie Dartigue and Sara Magloire, both from Haiti, share a love for fashion and a belief in the power that looking and feeling beautiful has for a woman. In 2009, combining their particular talents, shoemaking (Dartigue had established a sandals line prior to collaborating with Magloire) and jewellery-making established the Créations Dorées brand. 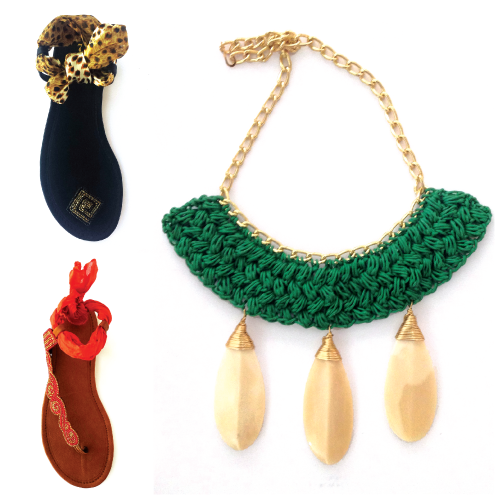 The line specializes in hand-crafted, unique sandals, rings, necklaces, headbands, earrings, bracelets and key chains which employ intricate beadwork, stunning semiprecious stones, fabric and leather. Each designer brings her own style of craftsmanship to the pieces which embrace the whimsical and the sophisticated sides of every woman. Dartigue, coming from a background of industrial engineering, favours semi-precious stones and metals for the construction of her jewellery pieces. She also continues her sandals line under the brand name, employing a wide range of techniques and materials which embrace the eclectic motif of the Créations Dorées line. Magloire embraces the art of beading and needlework inspired by her experience in interior design. What sets their pieces apart is the use of traditional artisanal methods such as leather and beadwork coupled with contemporary design. They try to create pieces in order to exceed the eye’s expectations. The line is not housed in a single standing establishment: the duo and their creations travel across the region to craft and trade fairs, such as Design Caribbean at Calabash 2014, and to the many retail stores that they supply.